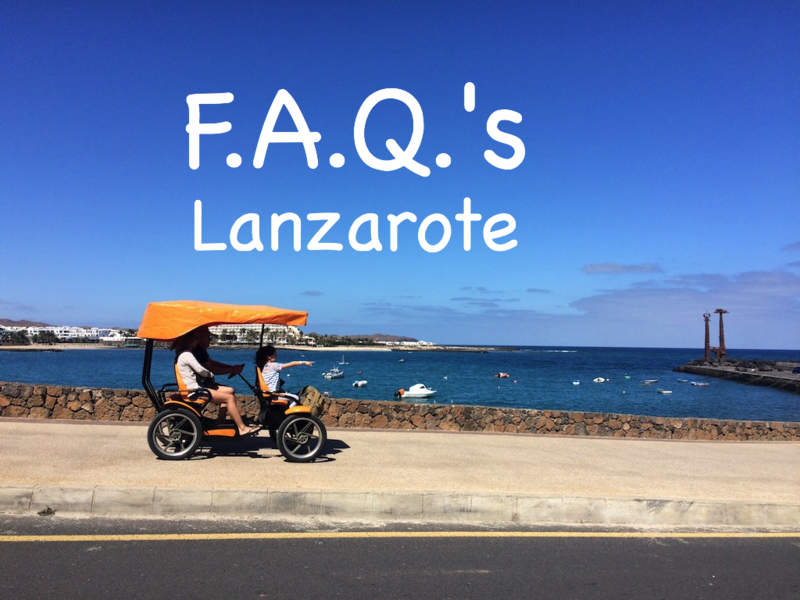 Frequently asked questions (FAQ’s) are really handy for any traveller so here are our FAQ’s about Lanzarote. Lanzarote is a Spanish island in the Canary Islands. It is in the Atlantic Ocean and located around 125KM from the coast of Africa. What is the capital of Lanzarote? Arrecife is the capital of Lanzarote and it is located in a central position on the east coast of the island. Is Lanzarote in the EU? This isn’t a straight forward question to answer! Lanzarote is considered to be geographically in Africa, fiscally part of The Canaries special tax regime and politically it is part of Spain and the EU. Yes, Lanzarote is duty free so you can enjoy cheaper products, but do make sure that you check your duty free allowance limits. The Canary Islands are often described as having the “worlds best climate”! Lanzarote does not have any extreme weather, the winter is warm and glorious and the summer is truly stunning but without the overbearing heat that you can experience in the Mediterranean. August is the warmest month with an average temperature of 25 degrees and January is the coolest month with an average temperature of 17 degrees. The trade winds are at their strongest in the hottest months, it’s nature’s way of keeping us cool. Lanzarote is almost classed as having a desert climate with an average annual rainfall of 124mm. The sea temperature rarely drops below 18 degrees, the warmest month is September. What are the resorts called in Lanzarote? There are 3 main holiday resorts in Lanzarote. Puerto del Carmen was the islands first holiday resort, starting with 2 hotels in the 1960’s. The harbour in the old town area remains an active fishing port. Stunning beaches stretch along the 6km strip, there’s lots of accommodation and plenty to do for the whole family. Costa Teguise in a man made resort, it tends to be the windiest of the three and it therefore attracts lots of windsurfing fans, but it is also a great choice for families as it is flat and there is so much to do including golf aquarium and a waterpark. Playa Blanca is the newest of the resorts and considered to be more upmarket. There are two harbours including Marina Rubicón and the old harbour which has a ferry service to Fuerteventura. The resort has two main beaches with facilities as well as the natural beaches of Papagayo. What is the airport in Lanzarote called? The airport is called Arrecife (ACE) and it is located in Playa Honda, between Arrecife and Puerto del Carmen. What local transport services are there? The local bus service (Intercity Bus) has a good connection with the capital and holiday resorts, and a limited service from the airport. There aren’t any trains on the island. Lanzarote has ferry services to La Graciosa, Fuerteventura, Gran Canaria and Tenerife (Naviera Armas & Fred Olsen). Taxis are available from the airport or at taxi ranks in resorts. What are the beaches like in Lanzarote? In one word, superb! Lanzarote has more than 100 beaches to chose from and whilst most of them are blessed with golden sand, there are a few that have black sand. There are an abundance of typical holiday beaches where you can hire sunbeds, pedalos, parasols and where the kids can safely paddle and swim. There are also beaches where you can enjoy the winds and swells that are brilliant for surfing and windsurfing. There is a beach for everyone on this island. What can I do in Lanzarote? The list is endless! The excursions are plentiful, the sights are not like anything you have ever seen before, the shopping is great, the gastronomy is fabulous and the beaches are special. Lanzarote is an all year round destination island, although summer is still considered to be the peak season which is generally during the school holidays in July and August, plus Christmas. In excess of 3 million tourists visited Lanzarote in 2017. What is the currency in Lanzarote? The currency in Lanzarote is the Euro. What language is spoken in Lanzarote? The official spoken language in Lanzarote is Spanish. English and German complete the top 3 languages spoken in the resorts. What time zone is Lanzarote in? Lanzarote operates the Western European Summer Time (WEST) and the Western Europe Time (WET) from March until October. Lanzarote changes it’s clocks on the same dates as the UK, so it is always the same time. Can I drink the water in Lanzarote? The water is desalinated in Lanzarote as the island does not have a natural water source, whilst it’s ok for brushing teeth etc, we don’t recommending it for drinking unless filtered. It’s best to buy bottled water for this destination. The crime rate in Lanzarote is low so, it is a safe place to visit. You should still exercise common sense by not leaving your valuables unattended, or visible in your hire car. Do I need to hire a car to enjoy the island? We would definitely recommend hiring a car whilst in Lanzarote. It is a cost effective way of being able to explore the island at your leisure, if you are staying in a resort. We hope we’ve covered the question you were looking for, but if not, contact us and we can add the answer to our FAQ’s about Lanzarote. Read more about Lanzarote and view our offers.